When the Saxo was replaced by the C3 in 2002, Citroën was temporarily left without a two-door saloon in its lower range. This void was filled in October 2003 with the introduction of the C2. Donato Coco, who had already penned the C3, designed a very compact hatchback, featuring sharper lines than its larger sister in order to attract younger drivers to Citroën showrooms. With engines ranging from 1.1 to 1.6 litre, the C2 offered great economy but was far from thrilling, even if its more potent version, the 125 hp VTS, was capable of interesting performances. Nonetheless Citroën felt necessary to make the C2 a worthy successor to the Saxo in rally racing. 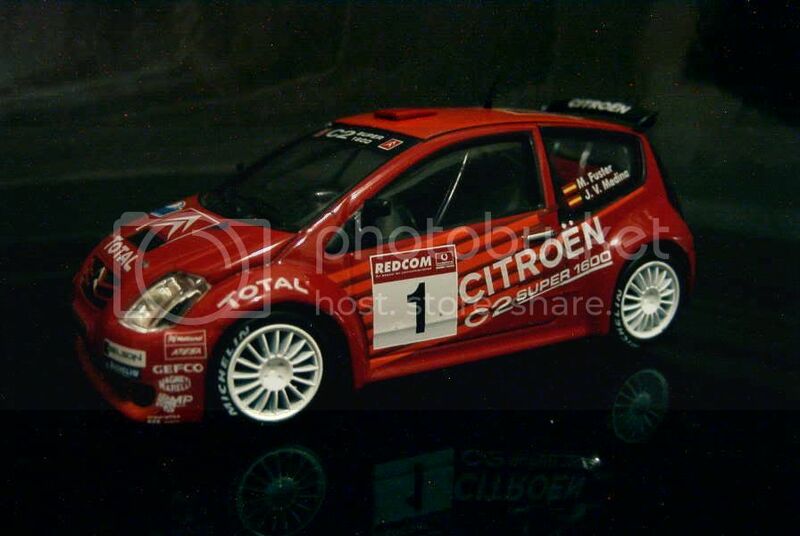 This goal was perfectly achieved, the C2, competing in the 1600cc Junior World Rally Championship, bagging several titles, including a 2001 crown for the promising Sébastien Loeb. Despite these successes, the commercial career of the C2 remained inglorious. Often ignored by Citroën which preferred to concentrate its efforts on the more mainstream C3, the C2 fought in the same league as the Twingo, without being able to unseat the ageing Renault as the supermini champion. Still produced today, the C2 is due to retire in 2010. 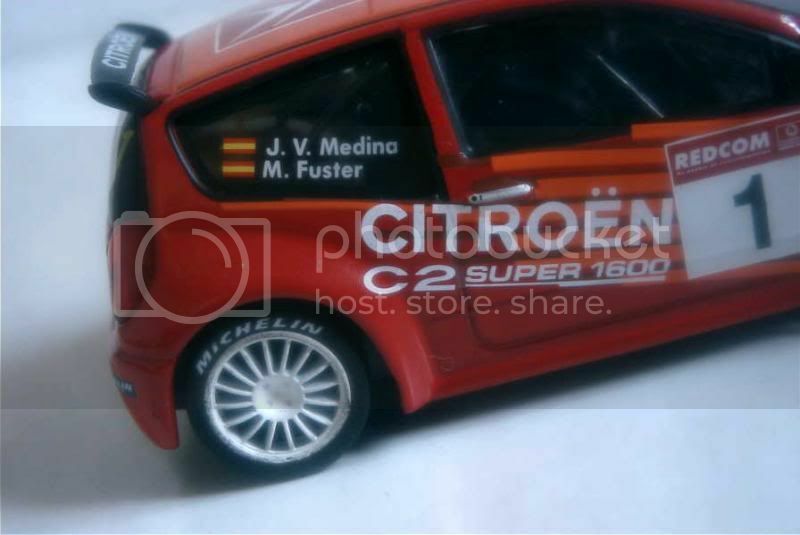 After wining the Spanish rally championship with a Saxo the previous year, Fuster upgraded to a C2 for 2004. Ixo made a correct model of the Spaniard’s car, which nonetheless suffers from the flaws common to most models of this Altaya series. In particular, the all-red rear lights somewhat spoil the final result, which is a pity. On the other hand, the front end and the tiny mirrors (which “glasses” are simply painted in silver though) are well modeled. 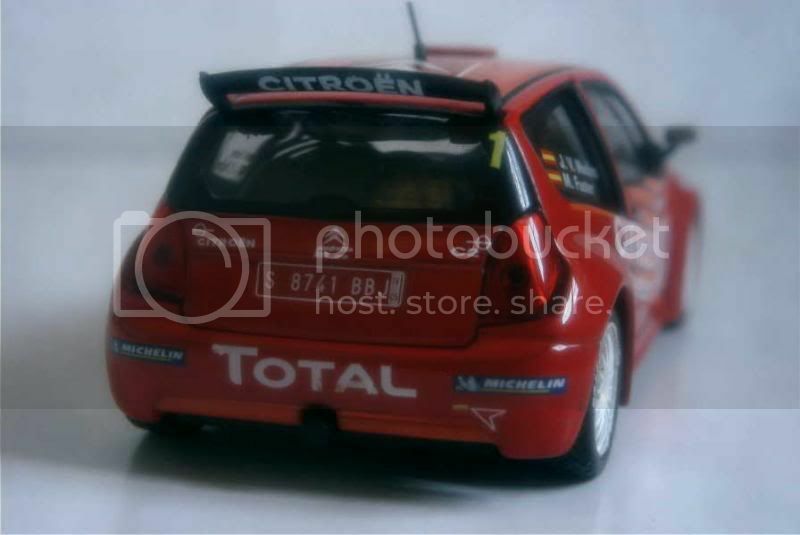 My rating is 12/20, but I have to add that this certainly is one of the best models in the Voitures de Rallye series. Although I tried to find the C2's results in this race, I ended up with nothing but pictures and no race results. By the way, you could perhaps know where to find white decal paper here in Manila. I heard for years that National Bookstores were selling it, but whatever the branch I only can find clear one... Thanks in advance! ohhh now theres a problem i've been trying to solve too for more than a year now, it seems that those white decal sheets are harder to find than our beloved diecast, i have a small tip i saw in an ad, will try to find out if they are still selling, then i'll let you know before i go there. fingers crossed! btw, do you prefer inkjet or laser decal sheets? I found what you both were looking for. Miguel Fuster was 3rd. He drives a Fiat Grande Punto during this season. Hello, again. 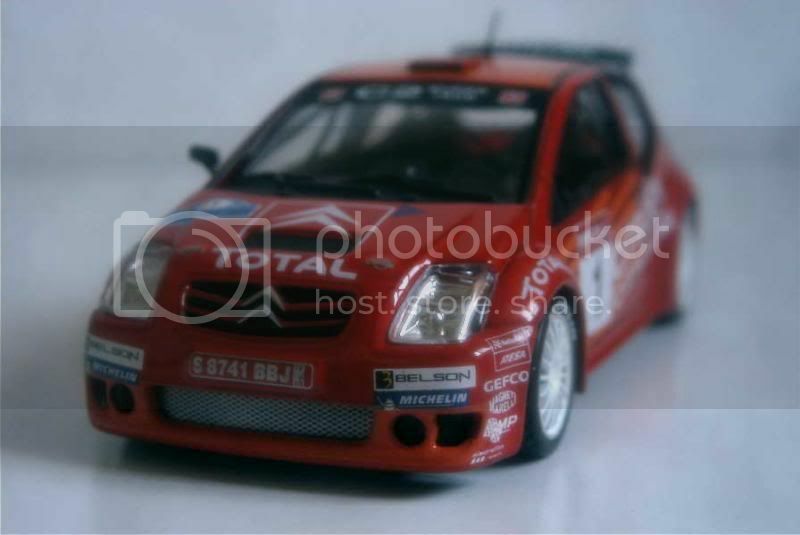 I've got this model too and the information that came with the model tell us that Miguel Fuster was 3th in the 2004 Rallye Rias Bajas. Miguel Fuster drives Fiat Grande Punto during ´09 season. I read this blog about races http://www.racingpasion.com/. It´s a very interesting blog. Thank you very much for your help. I'll correct this post in order to include this information. Thanks also for all the links, I'll have a look at them. That would be inkjet for me. Thanks for the information, even if it's rather disappointing. Let's hope though that your tip will still be helpful.